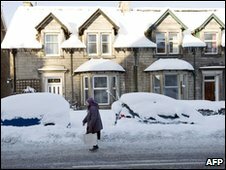 Advice from experts on how to deal with the cold snap has been pouring in since the big freeze descended on Britain. 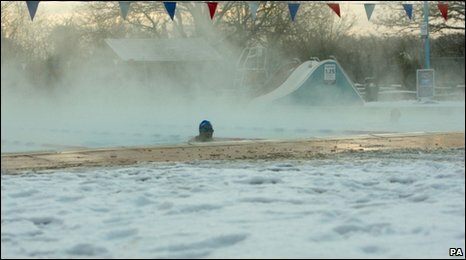 Now, with no let-up in sight, BBC website readers have been sending in their suggestions for how to keep warm and stay safe in sub-zero Britain. Layers, layers and then another layer. Forget fashion - look warm not cool. If you have to go out and walk about in the icy conditions, put an old pair of woolly socks over your shoes. This should help you stop slipping about. Hand warmers. I suffer from Raynaud's and my hands really suffer in the winter. Hand warmers with a reactive gel that heats up when agitated by pressing a disc inside the pouch are very effective and they can be recharged by placing in boiling water for 10 minutes. Two pairs of trousers: not thick enough to be uncomfortable on the bus, but plenty while walking around the shops. And a hat: never go anywhere without a hat in winter. Always have an emergency store. Keep tinned food, packet food and water (sealed) for use. This way you do have something in case the worst takes place. Keep a torch and camp stove in there too. If you live out in the country, keep an outside light on. In blizzards this can be a lifesaver to a stranded person. Do not forget the animals - wild and tame. I am amazed at the number of people who don't bother to close their curtains at night on frosty nights. In the current extreme icy weather, if you're not using a room during daylight hours, why open the curtains at all? Don't dry clothes on a heater because it doesn't allow the heat to spread across the room and you will soon find yourself in a very cold room. In the morning, drink a hot drink. Most importantly enjoy the day, play in the snow but once you feel the slightest bit of cold, dash back in, change into warm, dry clothes and have a hot drink. Stock up on food also if you haven't already done so. 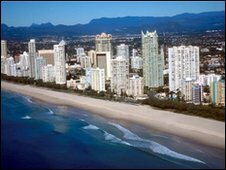 Go to Australia until April. Cover your car windscreen with an old bedsheet or piece of cardboard at night to stop it from icing up. Now, where did I leave my car? In Canada, we generally carry an extra pair of socks, a blanket, some biscuits or chocolate, and a nightlight candle in a tin with some matches. If you are stranded in the snow, it can be dangerous to run the engine (if the snow gets deep enough to bury the exhaust pipe) so the candle in the tin will create enough warmth in the car to keep you from freezing to death. Never had to use it yet, but I have this kit every winter. Clearing snow off the roof of your car. If you leave the snow on the roof the heat from your car will cause the base of the snow to melt. This means when you brake, the snow slides forward onto your windscreen blocking your view and in some cases causing the windscreen to crack due to the weight of the snow. Tyres, tyres, tyres. Correct pressure and at least double the legal minimum tread. Caught out in the centre of Edinburgh 29 December; could barely scale Henderson Terrace with approximately 1cm of snow and approximately 2mm tread. New tyres fitted on 30 and never been stopped by 10cm of granulated slush/salt since (even at double the gradients). A light right foot helps too. Some real world advice from a continental climate about driving in severe cold and snow conditions. Drum brakes can freeze up. This includes after you have left the car overnight with your handbrake on. Expect to lurch or stall when pulling away. In severe cold, below -15C, before you turn the ignition key flash your main beams - this takes a bit of battery power and thaws it a bit inside. It also tells you if you actually have a frozen battery (yes, really) before you really kill it by trying to start. If your wheels slip, try to pull away in a higher gear - in second rather than first which gives you more gentle pedal control. If you are stuck, in real trouble, where your wheels are slipping badly, to pull away resort to slightly deflating the drive wheel tyres - this gives them a larger area of contact with the road. Do not do this in deep snow as you lower the road clearance and risk getting stuck completely. To get uphill, wobble your steering wheel gently and rapidly from side to side, an oscillating motion. Works wonders. In general, do buy and use winter tyres in winter months. Even in normal winter conditions, at anything below 7C, they are much better at gripping on cold roads - even dry and cleared, treated ones - because their rubber compound is softer and sticky in the cold. You get half a year's use out of each set of tyres so they last twice as long in total, but after the fourth year their material will be inferior compared to new, even if the car was not driven much. Remember - you are not alone on the road, and your biggest risk is from other road users, though. So if you do not have to travel, stay at home.